July 2012 – Well, Here's Another Nice Mess . . .
Met a Girl Named Lola . . .
With temperatures reaching 100+ everyday, I had to spend most of my off time indoors. I should have done some household maintenance (well, I did do some); but I chose to read, listen to music and of course watch movies. I haven’t gotten around to the Kelly’s Heroes and Where Eagles Dare summer blockbuster double-feature, I’ve promised myself. (How I long to hear Burton intoning: “Broadsword calling Danny Boy . . .” once again.) They’re favorite Summer movies from my youth, so one weekend, I will do it. 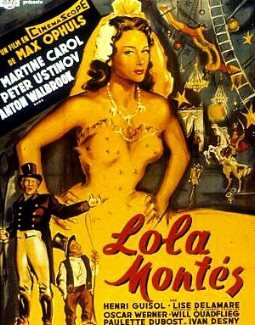 Among the films recently viewed was Max Ophuls’, Lola Montes (1955). I watched it again last night. Lola Montes, Ophuls last and, by seemingly most accounts, his greatest film, was based on a novel by Cécil Saint-Laurent titled “La Vie Extraordinaire de Lola Montès” which of course was based on the famed Lola Montez, aka Eliza Rosanna Gilbert, (17 February 1821 – 17 January 1861) an Irish dancer and actress who became famous as a “Spanish dancer”, courtesan and mistress of King Ludwig of Bavaria, who made her Countess of Landsfeld. She also had a lot of lovers–so the story goes. You can run to Wikipedia to fact check and read more. (I did.) All of these facts are interesting of course, but it is not necessary to know them to enjoy this extraordinary film. The framing conceit of the film is that Lola (Martine Carol) late in her career, utterly wound-down with no place to go, ends up as the main attraction in a traveling circus. There, she is placed on full display, performing various stunts in between episodes of her life being played out under the big top with narration barked out by the acerbic Ring Master (Peter Ustinov.) While the show goes on, Lola flashes back to various episodes in her life. It is a brilliant setup and allows Ophuls all sorts of visual delights and the fluidity to move into and out of Lola’s memories while she is on stage or backstage changing costumes; and Ophuls camera is seldom still, it’s constantly on the move. Playing the film a second time, (with Susan White’s dry, droning, academic commentary only partially entering my consciousness,) I freed myself from reading subtitles and was allowed greater freedom to simply watch the film unfold visually. 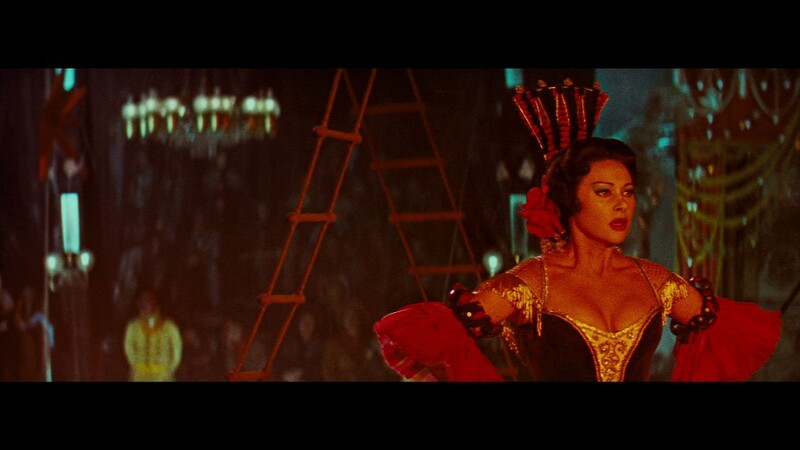 Lola Montes was the first and last time Ophuls used color and widescreen; but he certainly used it well. The color palette is dazzling and the way he uses/navigates the 2.55 CinemaScope frame with his moving camera, then dividing and re-framing with vertical, horizontal and slanted lines or matting off the screen to focus attention, create separate spaces, define relationships, etc. is a wonder to behold when you become aware of it. Ophuls complicated mise-en-scene is no accident. The production history of Lola Montes is rather famous, or infamous. At the time, it was the most expensive film ever produced in France and was a notorious flop, causing the producers to take the film away from Ophuls. They shortened and re-edited it, taking away its non-linear structure and effectively ruining the film. (Not dis-similar to what happened to Sergio Leone and his Once Upon a Time in America.) Ophuls died in 1957, his film in shambles and still fighting to have it restored to his cut. Over time, various people like Jean Luc Godard and Francois Truffaut championed a re-construction. Without going into long, complicated detail, a re-construction that mostly conforms to Max Ophuls’ vision now exists. There were three separate versions shot; one in French, one in German and one in English. The German and English versions are now lost and the French version had to be constructed from various cuts/prints. So, a totally definite version is probably not possible; but what we have is pretty close. Andrew Sarris, in 1963 after viewing an early re-construction, rather famously declared Lola Montes, the greatest film ever made. I wouldn’t want to burden any film with that epithet. Citizen Kane and Rules of the Game have often been labeled as such–and there are always plenty of people who think quite the opposite and they will tell you so. Indeed I have read opinions of Lola Montes stating that it was the biggest bore anyone ever had to sit through or that it left the viewer cold. The former opinion I cannot agree with; neither can I agree with the latter, but I can understand that someone might feel that way. I confess that I have had the Blu-ray of Lola Montes for over a year, and I only now have watched the film all of the way through. On my previous attempt, I believe that I made it to about the 30 minute mark–the scenes depicting Lola as a sixteen year old. Martine Carol was just not doing it for me and she sure didn’t play sixteen convincingly. Danielle Darrieux or Simone Simon, she was not. Playing opposite of Martine Carol, are the very flesh and blood Peter Ustivov; Anton Walbrook, as King Ludwig; Oskar Werner, a young Bavarian student. They are very good as are the many supporting players. I probably have not done Lola Montes justice. It certainly needs to be seen several times to observe all of Max Ophuls intentions and mise-en-scene. The only other Ophuls film I’d seen before Lola Montes was La Ronde (1950). The four films he made in America during the 1940s are all pretty much MIA in the U.S. as far a availability on DVD or Blu-ray. I am looking forward to catching up with some more of Max.